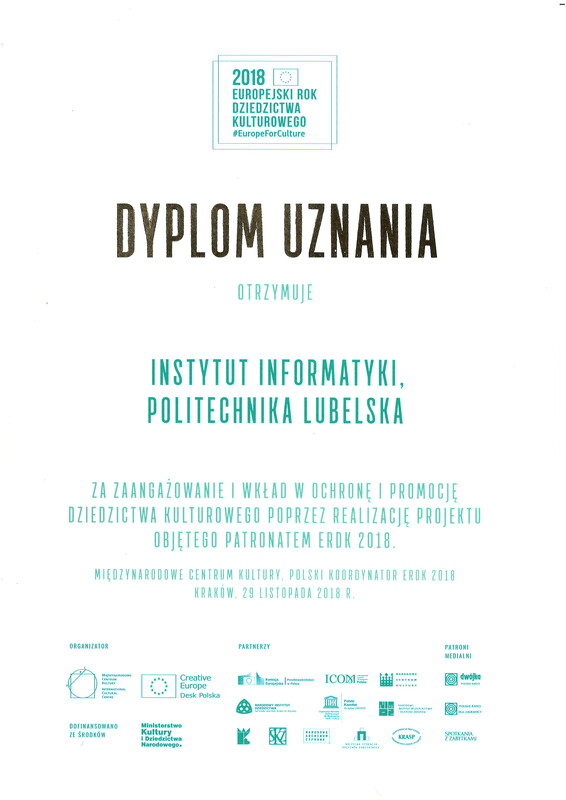 The Institute of Computer Science has received a diploma of appreciation for its involvement, contribution to the protection and promotion of cultural heritage as part of the European Year of Cultural Heritage (EYCH) 2018. The Institute of Computer Science and its Laboratory of Intelligent Systems Programming and Computer 3D Technology (Lab 3D) has been involved in the area of digitalisation of 3D artefacts of historical and cultural heritage for several years. This applies to monuments in Poland as well as abroad – in Central Asia (Uzbekistan and Kazakhstan). 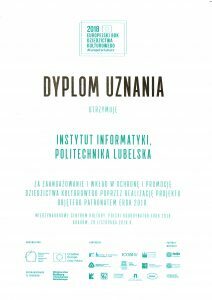 On 16 October 2018 the Institute of Computer Science organised a scientific conference “IT in Cultural Heritage Management (IT-CHM)” (https://cs.pollub.pl/muzealnicy-i-informatycy-na-politechnice-lubelskiej/), which was held as part of the European Year of Cultural Heritage 2018. The participants of the conference were several dozen employees from many museums in the Lublin and Subcarpathian Voivodships, directors of the main museums in Samarkand (Uzbekistan), representatives of archaeological companies and employees of the Institute of Computer Science involved in three-dimensional digitalisation and promotion of historical and cultural heritage objects in the Internet.